Shocking isn’t it, that a completely preventable disease is causing so much pain for people around the world. Gum disease can be prevented with good oral hygiene habits. Brushing your teeth properly twice a day for two minutes and cleaning between your teeth will prevent gum disease. So what is the best electric toothbrush for gum disease? It is simply the one that will make you consistently brush properly for two minutes twice a day. I feel that the Oral-B Genius Pro 8000 (USA) and the Oral-B Genius 9000 (UK) are the most likely electric toothbrushes to do this. Remember that any toothbrush is only as good as the user. As a dentist who diagnoses gum disease and has regularly written about electric toothbrushes for the past 4 years, I feel qualified to give you the information you need to decide which electric toothbrush is best for you. Every month, I carefully consider any new electric toothbrushes and update this list if I think they are any good. I last updated this article in February 2019. As this article is quite long, please use the quick navigation below to jump to the relevant section you are interested in. 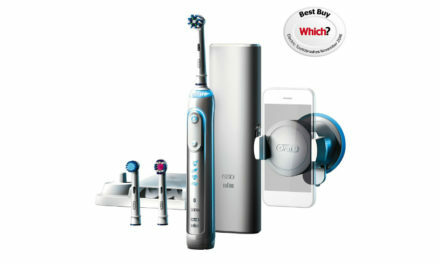 The Oral-B Genius Pro 8000 gives you all the tools you need to tackle gum disease effectively. It has a 2-minute quad pacer timer to ensure you brush your teeth for the correct amount of time. The Bluetooth connectivity to the Oral-B app will send you notifications to remind you to brush your teeth. The pressure sensor makes sure you brush with the correct force. Heck, it even makes sure you don’t miss an area whilst brushing through its position detection! I would thoroughly recommend this brush. It is currently $179.94 on Amazon. The Oral-B SmartSeries 7000 is a solid electric toothbrush for preventing gum disease. 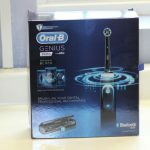 Just like the Oral-B Genius Pro 8000, it has a 2-minute quadpacer timer, visible pressure sensor and Bluetooth connectivity to the Oral-B app. The only area it falls short is ease of use. It has the old fashioned Nickel Metal Hydride battery which does not last as long. This means more charging and less brushing. Also, it does not have the position detection meaning you will not brush your teeth equally. It is currently $129.94 on Amazon. Functional and practical, the Oral-B Pro 1500 is a good basic electric toothbrush for gum disease. It cleans your teeth well and has a 2-minute quadpacer timer. The visible pressure sensor will prevent you from pressing too firmly on your gums. The Oral-B Pro 1500 comes with an upgraded lithium-ion battery, which holds the charge better. It does not have Bluetooth connectivity and no position detection. It is $69.94 on Amazon. The Oral-B Genius 9000 has all the features you would ever need to fight against gum disease. It has a 2-minute quadpacer timer ensuring that you will brush for the correct amount of time. The Bluetooth connectivity to your smartphone reminds you to brush your teeth twice a day. The visible pressure sensor can be customised to flash the colour of your choosing. 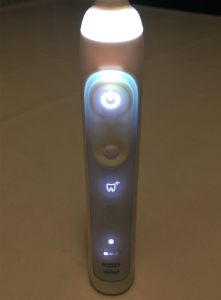 This electric toothbrush can even tell you if you have missed an area whilst brushing. What more could you need from an electric toothbrush? It is currently £128.00 on Amazon. The Oral-B Smart 5 is a good compromise between price and features. It has the same 2-minute quadpacer timer that the Oral-B Genius 9000 has. 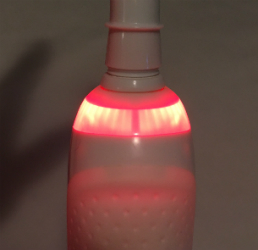 The pressure sensor on the rear of the handle flashes red when you press too hard. It has Bluetooth Connectivity although no position detection and the quality of the lithium-ion battery is good. 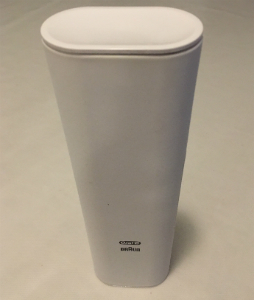 The travel case is of inferior quality and does not charge the electric toothbrush handle. It is currently £69.99 on Amazon. The Oral-B Pro 2 2500 is the most basic electric toothbrush I would recommend for gum disease. It uses the 3D Oscillating Rotating motion which has been shown to clean better than a manual toothbrush. It also has a 2-minute quadpacer timer and a visible pressure sensor. It does not have Bluetooth connectivity to your smartphone and the battery indicator light is difficult to read. 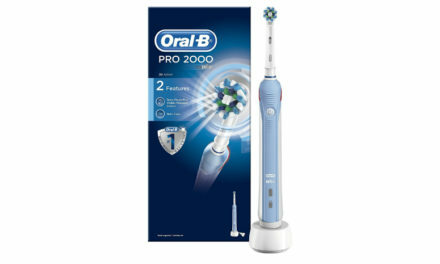 The Oral-B Pro 2 2500 is currently £36.75 on Amazon. How did I come to the decision of the best electric toothbrush for Gum Disease? After testing hundreds of electric toothbrushes, I personally use the Oral-B Genius 9000 (I am from the UK). Unfortunately, in the USA, they do not sell this model of electric toothbrush (yet) so I recommend the nearest alternative the Oral-B Genius Pro 8000. 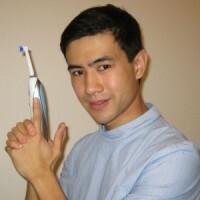 In the past, I did use the Oral-B Pro 2500. I think it is a great value for money toothbrush however after using the Oral-B Genius for over 2 years now, I find the overall package much better. I like how solid it feels in my hand, the ease of use and the improved battery life. The brush heads for Oral-B also are much better than their nearest competitors. The cleaning modes are neither here nor there. Normally I just stick it in daily clean mode and brush away. As a tech nerd, the Oral-B App is fantastic and takes about 30 seconds to set up. It is fun because it sends you quotes and pieces of news when you are brushing your teeth. The Oral-B app is also useful to use with the Oral-B Genius series because it checks where you are missing with position detection. This would be very useful for anyone who has gum disease. The stand you get with the Oral-B Genius is really practical especially if you have multiple brush heads. I also think the price given the features you get is reasonable. That is why I personally recommend the Oral-B Genius 9000 if you live in the UK and the Oral-B Genius Pro 8000 if you live in the USA. If you are more price conscious then go for the Oral-B Pro 2 2500 if yo live in the UK or the Oral-B Pro 1500 if you live in the USA. Gum disease is caused by dental plaque. The cleaning power of the electric toothbrush is integral to how well it removes dental plaque and prevents gum disease. The three main mechanisms of brushing are manual, sonic and 3D oscillating rotating. 3D oscillating rotating has been shown to generate the most cleaning power of the three. 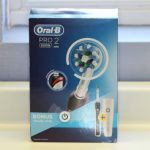 The only electric toothbrush manufacturer to use 3D oscillating rotating is Oral-B hence why all the electric toothbrushes recommended in this article are Oral-B. There is also 2D oscillating rotating which is inferior so make sure to check the electric toothbrush before buying. 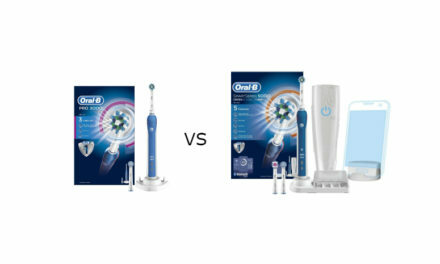 The Oral-B Genius pro 8000 (USA) and Oral-B Genius 9000 (UK) both use 3D Oscillating Rotating. The average person only brushes their teeth for 45 seconds! Brushing for two minutes twice a day is integral to preventing gum disease. This is because two minutes of brushing is optimal for dental plaque removal. Having an electric toothbrush that reminds you to brush your teeth for 2 minutes is a great oral hygiene tool. It is even better if it prompts you to change area of your mouth every 30 seconds. This is exactly what a 2 minute timer with quadpacer does. The quadpacer will mean that you will give your teeth an even brush and make you less likely to leave an area out. The Oral-B Genius pro 8000 (USA) and Oral-B Genius 9000 (UK) both have 2 minue timers with quadpacer. Most people press too firmly with an electric toothbrush and this can cause gum recession. A visible pressure sensor will help remind you to stop pressing too hard. Did you know the optimal amount of force to apply on an electric toothbrush is around 150grams. This translates into about the weight of an orange. 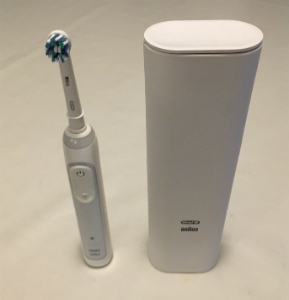 Look for an electric toothbrush with a pressure sensor. 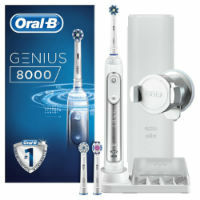 The Oral-B Genius pro 8000 (USA) and Oral-B Genius 9000 (UK) both have visible pressure sensors. Since the electric toothbrush is going to be around water a lot, it would make sense to make it waterproof. Electricity and water DO NOT mix. Fortunately for you, most sensible electric toothbrush manufacturers make them waterproof. It is always worthwhile checking though, just in case. You wouldn’t want a nasty surprise. Being able to take your electric toothbrush on holiday is important because even a few days of poor brushing could lead to your gum disease returning. A travel case will make it easier for you to take your electric toothbrush with you. 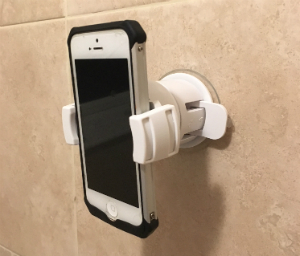 A travel case that charges your electric toothbrush is an added bonus and some even charge your smartphone at the same time. More and more electric toothbrushes are being able to connect to your smartphone. The reason I like these apps is that they remind people to brush their teeth. Some apps even show you if you have missed an area whilst cleaning. This will mean more thorough dental plaque removal and ultimately prevention of gum disease. An electric toothbrush is only good if you use it. Smartphone apps allow you to stay on top of your oral hygiene. 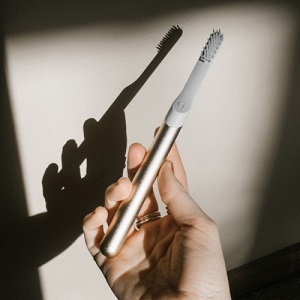 More and more innovative electric toothbrush manufacturers are moving towards delivering brush heads and toothpaste refills direct to your door. The two most prominent manufacturers in this space are Quip and Ordo. Using brush heads for too long will reduce the cleaning power of your electric toothbrush. This is because after 3 months the bristles start to fray and bacteria starts to proliferate on your brush head. This is of course not good for gum disease. Having brush head refills sent directly to your door, means you have no excuse to replace your brush head on time. If you hate charging electric toothbrushes as much as I do, then the longer the battery life is the better! There is nothing worse than getting to your electric toothbrush and it is out of battery. A good battery life to look for is at least 2 weeks using it twice a day for two minutes. This translates into 56 minutes of continuous use. This is not an essential feature for an electric toothbrush but it makes it a lot simpler to use. The other factor with batteries is the amount of time it takes to charge. The shorter the charging time the better. A good figure to aim for is around 6 hours of charging time. This means if you put it on just before you go to sleep, it should be fully charged in the morning. It really bugs me when patients come in with manual toothbrushes that look like elephants toothbrushes. OK OK, so I am exaggerating a little here. With brush heads the smaller it is the better. An optimal brush head size is around 1.5-2cm which is far smaller than what most people are using. This is because smaller brush heads make the toothbrush more manoeuvrable and easier to position close to the gum line. This is of particular importance if you have gum disease. Price is obviously an important factor when purchasing an electric toothbrush. It is always a balance between the features a brush has and its price. 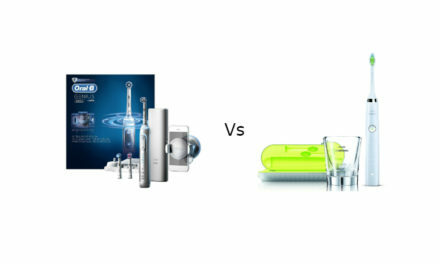 My two recommended electric toothbrushes the Oral-B Genius Pro 8000 (USA) and the Oral-B Genius 9000 (UK) are in the mid to upper range of price. This is because I believe the features are worth more than the price. This is especially so when compared to the cost of some of the Philips Sonicare! With an electric toothbrush for gum disease, you are really looking for an electric toothbrush that is not going to break the bank and is going to look after your teeth more effectively. Remember prevention is a lot better than cure (and plus it’s a hell of a lot cheaper!). Electric toothbrush manufacturers have of late been getting obsessed with the number of cleaning modes. What befuddles me is how these cleaning modes actually improve your brushing. In fact, my view is that the more cleaning modes an electric toothbrush has the more difficult it is to operate. If you really want to complicate your life with cleaning modes, the only decent ones to have are daily clean, sensitive and tongue brushing. The Gum massage and whitening cleaning modes are a complete waste of time. Are Electric Toothbrushes actually better than manual toothbrushes for gum disease? A manual toothbrush can clean as well as an electric toothbrush providing you use the correct technique. This is incredibly difficult to do on a consistent basis. It is much simpler to use an electric toothbrush as you just hold the toothbrush on your teeth and let it do the work for you. This is why I personally use an electric toothbrush on my teeth. Studies do show that electric toothbrushes do clean 21% better than manual toothbrushes over a 3 month period. This reduction in plaque is essential if you want to combat gum disease more effectively. What are the benefits of using an electric toothbrush for gum disease? Simpler and easier to use, you literally just move tooth to tooth holding the brush on your teeth. Is Oral-B or Sonicare better for gum disease? As Oral-B uses 3D oscillating rotating it could be argued that it cleans better than Sonicare and thus is better for gum disease. I do find in general that the Oral-B electric toothbrushes tend to be more feature rich and the Sonicare more style orientated. I personally would go for Oral-B every time. What are the best Oral-B Brush Heads for gum disease? Out of the Oral-B range, my preferred brush head is the CrossAction Brush Head. The CrossAction Brush head has bristles that are angled at 16 degrees which allow it to clean along the gum line. The bristles are of medium firmness and there are even indicator bristles that tell you when you need to replace the brush head. The CrossAction brush head is also small which makes it maneuverable around the mouth. The Oral-B Precision clean brush head is also good for gum disease. It has straight bristles and has largely been superseded by the CrossAction brush head. Is an electric toothbrush worth it for gum disease? Yes it is worth it. The main factors that are linked to gum disease are poor oral hygiene, diabetes and smoking. Poor oral hygiene is the easiest factor to get control of. An electric toothbrush is not only convenient but it also cleans your teeth better. Independent studies have shown better plaque removal with electric toothbrushes. There is, of course, the initial outlay for the electric toothbrush however in the long term it should mean fewer trips to the dentist and better oral health. What toothpaste is good to use for gum disease? The two ingredients to look out for in a toothpaste when fighting gum disease are triclosan and stannous fluoride. Triclosan is found in Colgate total and stannous fluoride is found in Oral-B Pro-Expert. Another new competitor to the market is Plaque HD. Plaque HD is a toothpaste that allows you to see the plaque that you are trying to clean off. This is a simple and effective way to check that you are removing the primary cause of gum disease, dental plaque. How do I use my electric toothbrush properly? Electric toothbrushes should be used differently to manual toothbrushes. They should be held at a 45-degree angle to the gum and slowly moved from tooth to tooth, spending around 3 seconds on each tooth. I find that many of my patients move the electric toothbrush too much and try to use it as a manual toothbrush. This is wrong! You have to let the electric toothbrush do the work. Thank you for reading this blog post on the best electric toothbrush for gum disease. If you do have any questions that you would like answered, then please ask them in the comments section below. Oral B vs Sonicare. Who wins?